We’ve reported in the past on how climate change is impacting wildlife around the world: from causing the Australian rat to go extinct, to forcing other species to adapt to survive. Perhaps unsurprisingly, we can now add bats to the list of those affected by the ever-changing climate, as they’re creatures that tend to travel to warmer areas when temperatures begin to drop. When they travel, bats usually do so in a swarm consisting of millions. 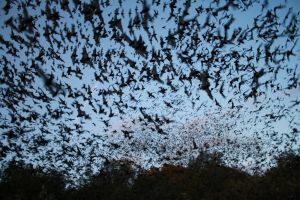 When Mexican free-tailed bats bats migrate from Mexico to the Bracken Cave in San Antonio, Texas, the size of the swarm is so large it can be tracked using weather radar. Phillip Stepanian and Charlotte Wainwright, two meteorologists from Rathamsted Research in the United Kingdom, recently studied this bat migration by analyzing years of weather radar data. Their research, now published in the journal Global Change Biology, reveals that these bats have been migrating to Texas much earlier than they did decades prior. Additionally, as of 2017, roughly 3.5 percent of the bat population is staying through the winter. Speaking with InsideClimateNews, Stepanian posited that climate change is causing spring to begin sooner, in turn prompting insects to move to Texas sooner and giving the bats something to eat without having to migrate. “To us, that sort of says winter conditions are becoming more tolerable and, rather than just going farther south, the bats are saying: We’re going to just hang out in Texas,” continued Stepanian. The disrupted cycle is expected to have an impact on the natural pest control service bats offer, via their massive consumption of insects, in other parts of the country. This could cause local crops to fail due to the number of remaining insects in the area, which in term could lead to increased pesticides use and potentially more bee deaths. Even worse, a change in bat migration patterns could change their ability to reproduce. Female bats typically produce one child at a time, and rely on the the corn-earworm moth to feed them. If climate change alters the moth’s life cycle, bats will have to find another source of food.